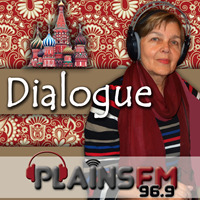 Dialogue is a monthly 25 minute show in the Russian language which is sponsored by the Russian Cultural Centre Trust which was established as a Charitable Trust in 2000. The mission is to provide our community members with settlement support and affordable education, information and cultural programmes and services promoting Russian language and culture here in Canterbury. As a result of our work we aim for the Russian-speaking community to be able to celebrate, share and maintain our cultural values and language while supporting our members to lead satisfying lives in Christchurch. Not only our Russian- speaking community members benefit from our work, but also the wider Christchurch community who engage with us to enjoy Russian music, art, language and cultural events, and connect with the Russian -speaking community in their settlement journey. Why do we celebrate the New Year on January 1st? We teach children and adults, organise concerts, theatrical performances and festivals and take part in many cultural events of the city. We generally work within the usual areas of charitable non-profit organisations. Apart from the aims, indicated in the Russian Cultural Centre Statute, our main goal is to promote and preserve the Russian language and culture. Furthermore, we have a wider goal: to give everyone an opportunity to share their knowledge and experience with other people in the Russian Community.